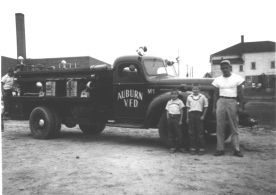 1953 Approximately twenty-five Auburn residents met to discuss the organization of a local volunteer fire company. This process assisted by the Auburn Community Fair Board, which donated two thousand dollars towards the start-up cost of the project. Before the end of the year, an association was formed, a constitution and by-laws were adopted, officers were elected, fund raising activities were proposed, a fire station was planned and efforts were made to secure a used fire engine for the cost of eleven hundred dollars. 1954 In this year the ground breaking on the northeast corner of Washington Street and Auburn Road for the new three bay fire station started. The building was erected through the efforts and determination of the early members, township officials, local residents and businesses. While this was occurring, plans were made to develop an alerting system using a radio transmission with the antenna on the roof of the old church at Auburn Corners, members were being trained in the basics of fire fighting, several fund raisers were held and a used tanker was purchased (with money loaned to the department from one of its founding members). A considerable amount of time and energy was put into the two used trucks the department purchased, as they both required a substantial amount of repair before they could be put into service. The fall season found the department ready to respond to its first emergency call. 1955 The members were still busy finishing the interior of the fire station. This did not deter them from sponsoring a number of fund raising activities. The early years of the department found them hosting dances, auctions and turkey shoots to supplement the one thousand dollar annual contract with the township. The members worked very closely with the Auburn Community Fair Board, going so far as to put on a minstrel show during one of their events. 1956 A major addition to the department during the year was the purchase of their first new piece of firefighting apparatus. It was a high pressure fog equipped pumper that cost over seven thousand dollars. This was also the year that the clambake came to be an ongoing tradition of the department. 1957 The members were busy taking advanced training courses in both fire fighting and first aid. The department purchased their first resuscitator (a device used to deliver oxygen to ill or injured patients). 1958 This year the members worked on plans for a grass and brush fire truck in addition to their fund raising efforts. 1959 The chassis for the grass truck was ordered and the members gathered together to construct the back end of the vehicle to best serve the needs of the township. 1960 Plans were well underway and construction started on the addition to the north end of the fire station, adding an additional bay and kitchen facilities to the structure. Work was also being done on the telephone alerting lines and the radio system. 1961 The department officially joined the Ohio State Fire Fighters Association during the year. Fire training, fundraising and maintenance work to hook took up the bulk of the year. 1962 A fast moving fire that was believed to have been caused by a malfunction in the heating system destroyed the gymnasium at the Auburn school. 1963 Newer alerting radios were purchased this year. The members planned their first door-to-door donation drive in three years to help defray the cost of the radios. 1964 The opening of the Ladue Reservoir to boating was the big event of the year, with the City of Akron placing on hundred rental boats on the lake. The first fatality there was a man killed by lightening in late August. A new radio transmitter was purchased and the department was asked to assist in providing fire protection during the County Fair, an activity that continues to the present time.